From "staycations" to knitting clubs, frugal living is increasingly in vogue as families look to cut costs during the economic downturn. Supermarkets expand their budget lines and two-for-one deals, while magazines offer tips and sewing templates to help people make clothes at home. Now, 70 years after the outbreak of World War II, High Street department chain John Lewis is getting in on the act - by turning the clock back to the days of the Blitz. 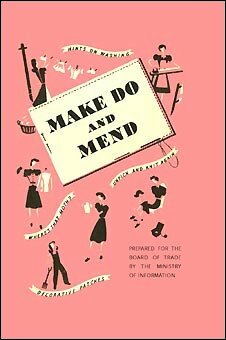 It is publishing what it calls a "modern reworking" of the famous 1943 government booklet on making the most of minimal resources - Make Do And Mend. Whereas the wartime version offered tips on getting the maximum juice out of a lemon, the updated booklet includes hints on setting your central heating controls economically. Housed between 1940s-style covers, the new 34-page volume also explains how to get the correct-sized television for the size of your room. But not all the tips are so modern - there is also timeless advice; for example, how to get rid of ants, and practical household uses for white vinegar. "The ideas inside are as relevant today as they were when our grandmothers had to make do and mend, back in the days of rationing and digging for victory," says Isobel McKenzie-Price, editor of magazine Ideal Home. Originally issued by the Ministry of Information, the wartime edition offered tips on how to re-invigorate old clothes by darning and fixing frayed edges, and how to keep moths away. Households could learn about unpicking the wool from old pullovers to darn socks, or how to alter the cut of a coat or dress to give it a new lease of life. For six years of war, and on into the 1950s, the United Kingdom survived by the "waste-not, want-not" ethos, which saw frugality and recycling extend to the likes of using waste paper to make roofs for houses. People were also asked to hand in saucepans as salvage, and park railings were torn up. Clothes and materials were in short supply too, so people had to wear the same clothes for a long time. When the clothes wore out, people were asked to make them into something else or repair them. 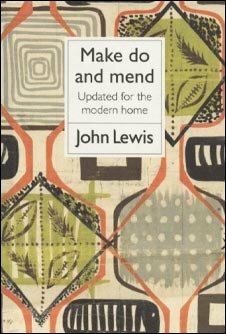 When Make Do And Mend was published both food and clothes were already being rationed. A reprinted version of the original pamphlet has been published by the Imperial War Museum, and is on sale to those seeking handy wartime households tips. "Make Do And Mend stemmed from the fact that at the beginning of 1941 clothes began to be rationed," says Terry Charman, senior historian at the museum. "Clothes wear out very quickly, and children grow very quickly, and - coupled with the shortage of materials - it meant that wartime 'utility' clothing had to be developed. "There were standard clothing designs introduced, and without things like pockets or turn-ups which used up extra cloth. " At first it fell to the Women's Voluntary Service to offer clothing tips and to organise swapping sessions of clothes. But two years later the government then published its famous booklet. "It offered all sorts of hints on how to make things go further and last longer, particularly clothing, " said Mr Charman. "It was about eking out the clothing ration to the maximum. 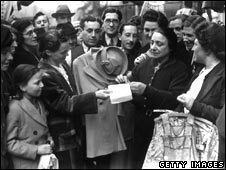 In fact clothing rationing lasted until 1949." And, while today's economic circumstances do not compare to those dark days, John Lewis believes there is a similar desire today to make the best of what may be increasingly straitened personal circumstances. "We have for now become a nation doing our best to weave thrift with quality on a daily basis and this guide is designed to help households to get the very best of what they have," says John Lewis managing director Andy Street. "Our lives are far more complicated then they were in the 1940s and we've forgotten some of the basic principles that that can save a lot of time and unnecessary expense." Mr Street believes that people are taking a new interest in "traditional skills, including creating and maintaining things". As evidence, John Lewis says that haberdashery sales have risen by 17% over the past year, with fabric sales having their strongest year for five years. Sales of yarns, wools, craft materials, buttons, and sewing machines and boxes, have all soared, the retailer says. But according to Mr Charman of the Imperial War Museum, this harking back to the wartime during economic difficulties is nothing new. "I started here at the museum in 1974 and have been through many recessions, and every time the same question gets asked - 'how did they cope during the war? '," he says. "There have been many recessions since the 1970s, and each time the reaction is the same. I first noticed this same trend happening again at the end of last year and beginning of 2009. "But when you look at what the government was advising in the 1940s, a lot of it is common sense and the same as today's advice - things like not wasting water, and turning off lights." But for now it appears there is a hunger to discover how war and recessions can be overcome with the help of handy household hints.